Cecilia “CiCi” Freemont has a restless soul and the voice of an angel. Leaving her privileged upbringing behind, she chases her dreams to the sandy beaches of an unspoiled Hawaiian paradise, Harbor Island. But life takes an unexpected turn when she falls for the island’s young heir-apparent and her newfound adventure becomes too much to bear . . . Investigative journalist Tina Templeton has dedicated herself to the pursuit of truth. 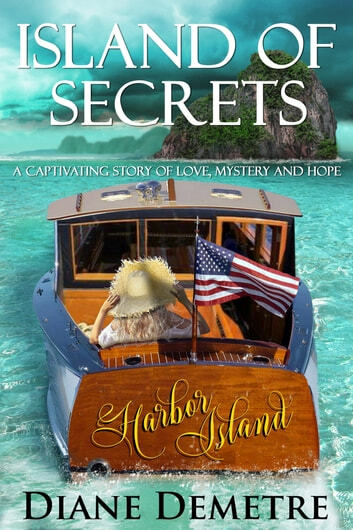 But when she inherits Harbor Island, her career plans take a confusing twist. Managing the sprawling island estate is tough business even with the help of aging cabaret singer, CiCi Freemont. Especially when a massive ecological disaster threatens to destroy her beautiful beaches — and the responding coast guard captain steals her heart. Island of Secrets is an epic love story. If you like generations-spanning drama, characters with hidden pasts, heart-warming romance and intrigue, then you’ll love Diane Demetre’s powerful novel in paradise. Buy Island of Secrets to fall in love with a tropical romantic mystery today!